In 2012, Dr. Hawa Abdi was nominated for the Nobel Peace Prize for her decades of humanitarian work in Somalia. Actress and humanitarian Angelina Jolie presented her story. Photo courtesy of Clinton Global Initiative. In 2016, the Clinton Global Initiative awarded Dr. Hawa Abdi with a Global Citizen Award for Leadership in Civic Society. Iman, the international supermodel and entrepreneur, presented the award to Dr. Deqo, who accepted it on her mother's behalf. In 2010, Dr. Hawa Abdi and her daughters, Dr. Deqo and Dr. Amina, were named Glamour Magazine's Woman of the Year. In 2017, Dr. Deqo Mohamed was awarded the Women’s Bell Award by the African Leadership Network. Graça Machel, the Mozambican humanitarian and widow of Nelson Mandela, presented Dr. Deqo with the award. Black Entertainment Television (BET) honored Dr. Hawa Abdi and her daughters at the 2012 Black Girls Rock! Award Show. 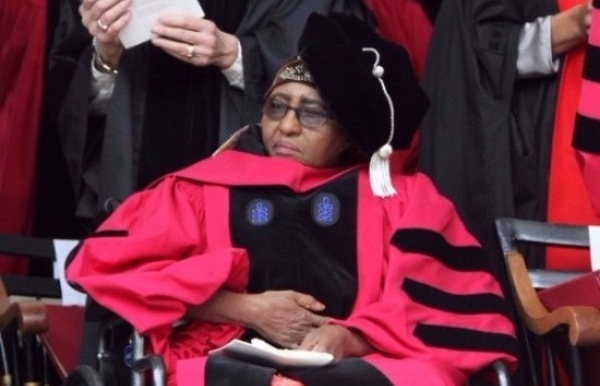 In the spring 2017, Dr. Hawa Abdi and Dr. Deqo Mohamed were both recipients of honorary degrees -- Dr. Hawa received an honorary Doctor of Laws from Harvard University, and Dr. Deqo received an honorary degree from Chatham University in Pittsburgh, where she also delivered the 2017 Commencement Address. In April 2017, Dr. Deqo and Dr. Hawa delivered the Chubb Fellowship Address at Yale University, where Dr. Deqo was a Maurice Greenberg World Fellow in 2016. In 2016, Dr. Hawa Abdi received an honorary Doctor of Sciences from the University of Pennsylvania.